1889 – Eglinton Silica Brick Company Limited, Dundyvan, Coatbridge owned by the Eglinton Chemical Company in 1889 and managed by J.A. MacDonald. It was one of the few Scottish brickworks to specialise in making silica bricks. In the 1914 – 1918 warwhen the supply of Austrian magnesite was cut off, the brickworks turned to burning Greek and Manchurian raw magnesite. It was known as the Eglinton Magnesite Brick Company in 1928. Source Kenneth W Sanderson. Below – 1897 – Eglinton Silica Brick Works, Dundyvan. 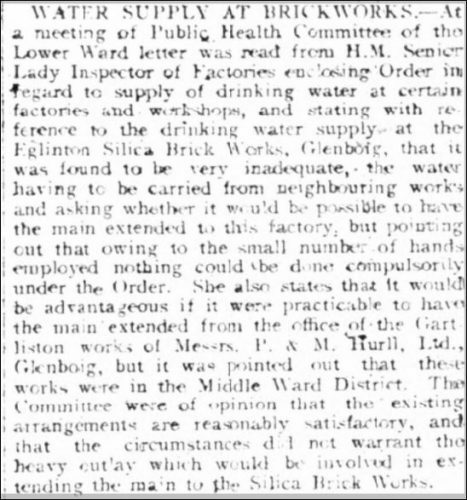 02/12/1897 – Glasgow Herald – Brickworks – foreman – wanted, experienced thoroughly steady and capable man to manage Silica Brick Works near Glasgow. 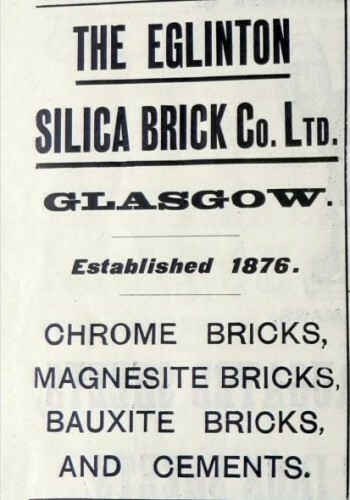 Wages for first class man, 50s per week with engagement – apply by letter only, stating experience to the Eglinton Silica Brick Company Limited, 70 Great Clyde Street. 1903 – Eglinton (The) Silica Brick Co. Limited (silicate bricks) – Eglinton brick works, Dundyvan ; office, South Exchange Court, Glasgow. Below – 1910 – Eglinton Silica Brick Works, Dundyvan (and still present in 1938). 1910 – 1911 -Eglinton (The) Silica Brick Co. Limited. Manufacturers of Magnesite bricks and cement for basic furnace linings.Works Dundyvan, Coatbridge. Registered Office – William J. A Donald, 60 Firhill Road. 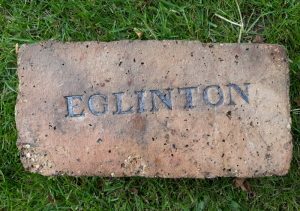 1910 – 1911 – Eglinton (The) Silica Brick Co. Limited . Manufacturers of Silica, Bauxite, Chrome and Magnesite bricks and cements for acid and basic furnace linings. Registered Office – William J. A Donald, 60 Firhill Road. 1911 – 12 – William J. 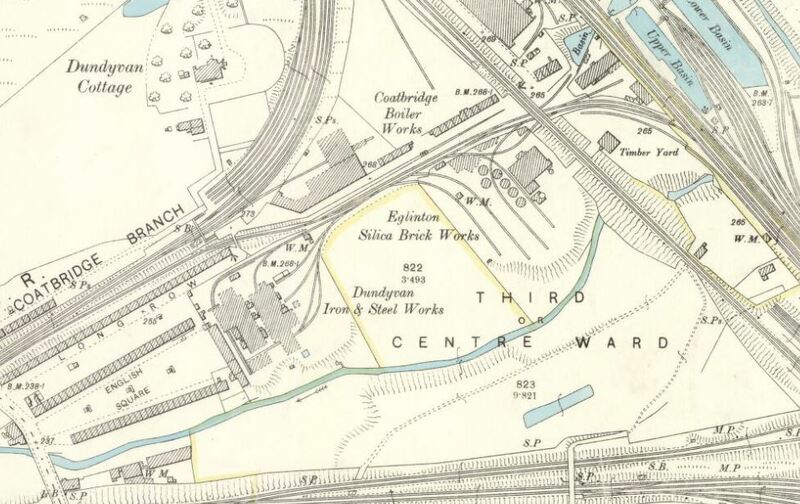 A Donald , Manufacturer, 60 Firhill Road (of the Eglinton Silica Brick Co , Ld., and the Firhill Lime and Whiting Co., Ld ; works, Coat bridge and Glasgow); res., Coltswood, Coatbridge. 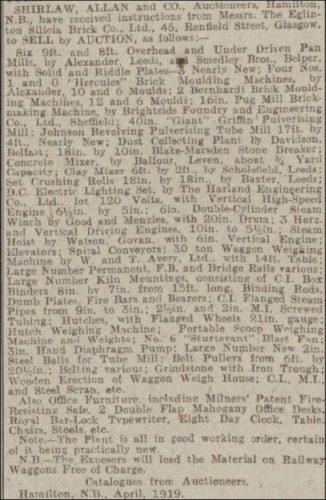 21/03/1916 – Daily Record – Men wanted immediately for temporary employment during this week discharging magnesite from wagons on to the ground; 6d per ton will be paid each man as soon as wagons are emptied……… The Eglinton Silica Brick Co Ltd., Atlas Brick Works, Armadale. Men wanted immediately for temporary employment during this week discharging magnesite from wagons on to the ground; 6d per ton will be paid each man as soon as wagons are emptied……… The Eglinton Silica Brick Co Ltd., Shawsrigg Brick Works, Larkhall. Men wanted immediately for temporary employment during this week discharging magnesite from wagons on to the ground; 6d per ton will be paid each man as soon as wagons are emptied……… The Eglinton Silica Brick Co Ltd., Garnqueen Brick Works, Glenboig. 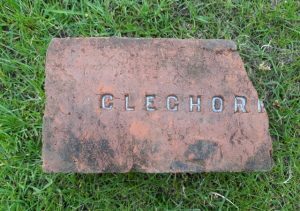 10/06/1916 – Hamilton Advertiser – Wanted – Joiner for our Cleghorn Works – Apply The Eglinton Silica Brick Co Ltd, 45 Renfield Street, Glasgow on Monday. Also wanted – first class mechanic for our works at Cleghorn. 29/06/1916 – Hamilton Advertiser – Stonebreaker (experienced) wanted. Good wages, local man preferred. 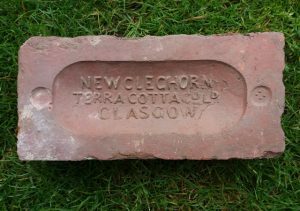 Apply personally to The Eglinton Silica Brick Co Ltd – Terra Cotta Works, Cleghorn. 07/12/1917 – Brickworkers (6) wanted at Garnqueen Brick Works, Glenboig. Class A work – Eglinton Silica Brick Company. 13/04/1918 – Daily Record – Kiln Burner wanted – Apply The Eglinton Silica Brick Co Ltd, Dundyvan Brickworks, Coatbridge. Below – 29/04/1919 – Sheffield Daily Telegraph – Eglinton Silica Brick Co Ltd for sale. 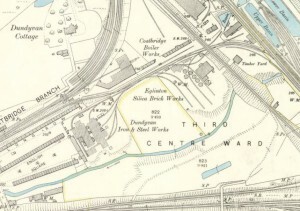 Below – 04/06/1919 – Kirkintilloch – Water supply issues at the Eglinton Silica Brick Works, Glenboig. 27/11/1920 – Airdrie and Coatbridge Advertiser – Boy wanted at once for Works Office. Good at figures. Apply Dundyvan Brickworks, Coatbridge. 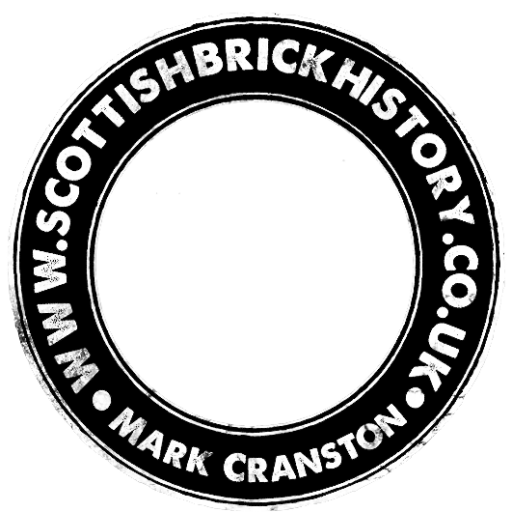 24/10/1921 – The Scotsman – The Eglinton Silica Brick Co Ltd (in voluntary liquidation) The subscriber having sold the works and business of the above mentioned company to the Eglinton Magnesite Brick Company Limited as at 27/09/1921 ceased to have any interest therein from the said date. All persons having claims against The Eglinton Silica Brick Co Ltd or the subscriber as liquidator, thereof, are requested to lodge them with him within 10 days from this date. David Guthrie, C.A Liquidator. 31 St Vincent Place, Glasgow. 20/10/1921. 1928 – Eglinton Silica Brick Company Limited, Dundyvan, Coatbridge owned by the Eglinton Chemical Company in 1889 and managed by J.A. MacDonald. It was one of the few Scottish brickworks to specialise in making silica bricks. In the 1914 – 1918 warwhen the supply of Austrian magnesite was cut off, the brickworks turned to burning Greek and Manchurian raw magnesite. It was known as the Eglinton Magnesite Brick Company in 1928. Source Kenneth W Sanderson. 19/03/1930 – Dundee Courier – Valuation Appeal Court, Edinburgh ……Appeals which were persisted in by the Inland Revenue and which were allowed by the court were those relating to…..Eglinton Magnesite Brick Company Limited, Coatbridge. Below – 03/08/1940 – The Scotsman – Eglinton Magnesite Brick Company Limited, Dundyvan Brickworks, Coatbridge in voluntary liquidation. 1942 – 1943 – Eglinton Magnesite Brick Co Ltd. Brick and Tile Maker, Dundyvan. The Eglinton Silica Brick Co., Ltd. 45, Renfield Street, Glasgow. 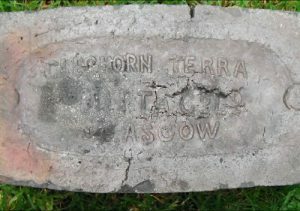 The silica-brick trade in Scotland was started by the Eglinton Chemical Co., of which the present company was originally a branch, about the year 1876, for the supply of silica bricks to Scottish Steel Works. The raw material at first employed was flint from County Antrim, Ireland. Later, chalk flints were imported from the Thames and, to a certain extent, from the northern shores of France. The Thames flints could at one time be bought at 5s. to 6s. per ton c.i.f. Grangemouth. These flints were calcined in shaft kilns, and each kind had different characteristics; the French flints, while purer chemically, were low in fusion point. The bonding material was highly plastic clay obtained from South Wales. The bricks were moulded by hand machines, which, until recently, were exclusively used in this country for moulding silica bricks ; these have now been superseded by power presses, which are doing just as satisfactory work as that done in the past by manual labour. After being dried, silica bricks were burned in Beehive kilns, at a temperature of about 1400° C. These flint bricks contained about 93 per cent, silica, the balance being alumina, lime and iron. They were chiefly used in the chequers of steel furnaces, where thev would stand better than the best English bricks. They were, however, used also in the crowns of steel furnaces in several works in Scotland, as well as in other parts. One great advantage of these bricks consisted in their less expansion than other silica-bricks, and they were, therefore, better able to withstand variation of temperature without cracking. Also they could be employed in furnaces for repairs during fettling, and for this purpose alone were in great demand. Until recently little enquiry had been made as to the ganisters used in Scotland, but, judging from the samples that have been hitherto submitted to us there is nothing in this country to compare with the English ganister. There are, however, considerable deposits of quartzite in the islands and west coast of Scotland which have been brought to our notice by the Geological Survey, and which, we believe, could be easily delivered at Glasgow at prices which should enable them to be used for refractory purposes. Quartzites are largely quarried in the United States for the raw materials of silica-brick manufacturers. Practical tests have been made of the samples submitted, and our opinion is that the deposit -Sample No. 2 (North side of Loch Leven, Ballachulish, 1 mile east of Callart Cottage), might be expected to give the quartzite best fitted for tile manufacture of silica-bricks. The Eglinton Silica Brick Company is at present (1916) entirely engaged in the manufacture of magnesite bricks from imported material. The above information and report on samples has been kindly supplied by Mr. Wm. Donald, Manager of the Eglinton Silica Brick Co. Plastic clay was a raw material that was used as a bonding material in the silica-brick trade. British Geological Survey Petrology Collection sample number MC 7443. 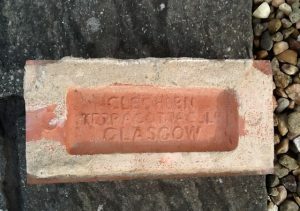 It is recorded that in the 1870s the Eglinton Silica Brick Company Limited, 43 Renfield Street, Glasgow used plastic clays to bond silica-bricks made from flints either imported from the Thames area or northern France and that the bricks were bonded with highly plastic clay from South Wales. 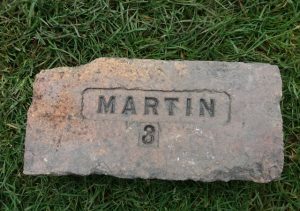 The resulting bricks were used in steel works. There is no evidence that plastic clay from this locality was worked, though it was collected during exploration for natural resources. 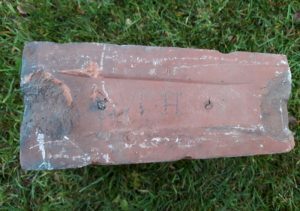 Found by Tucker Kennedy at Ardeer, Ayrshire. Eglinton Fire Clay Works, Eglinton. 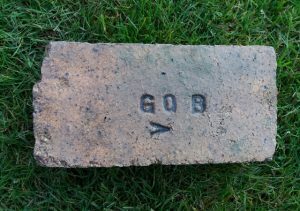 or The Eglinton Silica Brick Company Limited, Dundyvan, Coatbridge. or Eglinton Iron Fireclay Works, Eglinton. 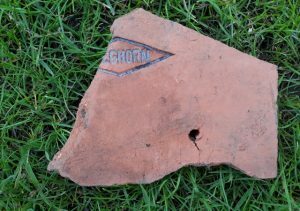 Found at the old Garnqueen site, Glenboig. Garnqueen Fireclay Works, Glenboig, Lanarkshire. . . . .